Till now, you can hear very often even from professionals that the play of the team and its results become defining in successful work with fans. But it’s kind of uninteresting and pretty superficial to expect that a good team play will solve all the problems. Would you like to create a family with a person who will leave you if things temporarily go wrong? No one likes glory hunters. But for some reason, many clubs continue to target them instead of creating a long-term strategy for working with fans. I may hear in response, “But we are building playgrounds.” It’s great you understand the importance of working with a young audience. But we’re not living in the 1990s now to build football grounds and hope for a return. It was back then that free football grounds drew queues. Now you have to try very hard to drag the kids to the playground. As you may already know, I am guided by a three-level approach in my work, which I’ve derived for myself. In a more complete form, you can use a nine-level approach I’ve also written about, but in this case, it is very difficult to create a decent message, let alone wrap it up into a beautiful form. So personally, I prefer the three-level approach. This is a simplification that allows me to create a more effective message. The society determines the form of my appeal. 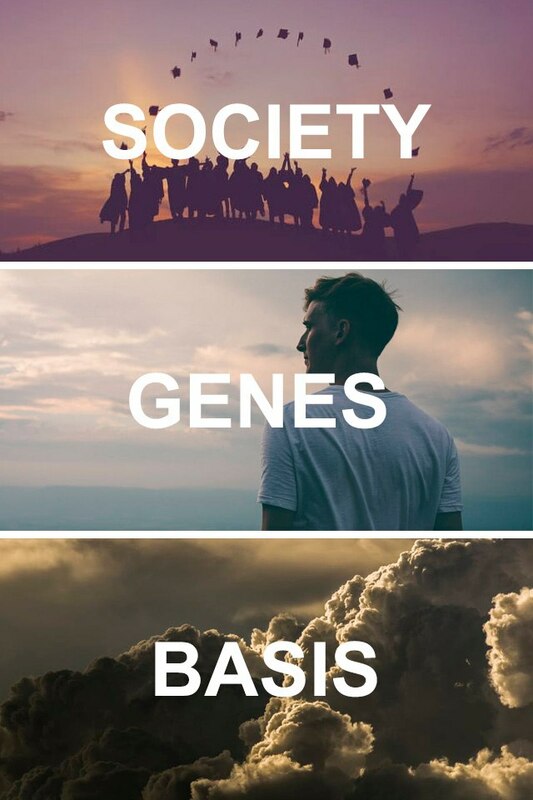 These are the differences among representatives of our species, which are created in the society after our birth. I use small data to understand the target audience. Without the use of small data, the effectiveness of our empathy for a representative of another group does not exceed 25%. At the same time, we understand the representatives of our own group, i.e. people like ourselves, well enough. Evolution/genes determine the very essence of the appeal. For instance, evolutionary psychology is applied, which enables us to use evolutional peculiarities in the context of the present time. Genetic peculiarities of the development of our species are also used. The basis of our life (as well as the life of other animals and plants) is only one – reproduction. Nature brings the reproductive function to the forefront. This function is masked beneath a whole lot of other peculiarities, related by me to “evolution/genes”. Nature directs us in many ways. And for sure, nature controls us with hormones. The essence of this approach is the understanding of human actions. But most marketers do not even try so far to take into account at least the basic features of human decision-making. Focus on attracting glory hunters is just one example of the way such marketers work. But what is the most important for a person? Strangely enough, these are emotions. They are important even for glory hunters and all those who, in the twenty-first century, are trying to convince the others and, above all, themselves in the logicality of people. Fortunately, now we know about the somatic marker hypothesis, which is the basis of neuromarketing. This hypothesis, which has received some practical evidence, allows us to understand at a relatively simple level how the decision-making process works. In response to each experience we get, our brain creates a certain emotional (somatic) marker. These markers are created and can be updated with a new experience we get, but most likely, the negative emotional (somatic) marker received first will not let you get the experience again. I mean, only positive markers can be updated in most cases. This system exists for the sake of preserving the energy expended by the brain. This organ is extremely voracious, therefore, energy is saved by many peculiar ways, which, incidentally, can also be used in marketing. So, emotions really mean much more for us than it might seem at first glance. Add to that mirror neurons, and they present to us not the habitual person from our perception, but something, I might say, extraordinary and very peculiar. It is these animals that we are. But why football? Sport is in great danger in today’s rapidly changing world, but fortunately, sport, and especially football, has a big advantage. You are rooting for a certain club for a reason. Do you know what the terror management theory is? As I have already described, without emotions, the sport is uninteresting. The peculiarity of our brain is that we are putting an additional meaning into our lives. Terror management theory from social psychology suggests that it is this kind of meaning that allows us to control our fear of death. Emotions involve our mirror neurons, and we begin to live the state of an athlete during a particular event. A good sports drama in real life is no different from a quality film with an emotional script. Great emotions help us give extra meaning to the sport in order to elevate it to something immortal which will remain after us. At a basic level, it’s just a way of coping with the fear of death, whereas, in reality, something very special happens. Without this element, sport becomes less interesting. But football still provides a lot of emotions. Victories and defeats become something crucial for the fans. Experiments show that when you remind people of their mortality, it becomes a trigger for the increased influence of the terror management theory. But the most interesting thing is that, according to research conducted within the framework of basketball, a reminder of death positively affects the motivation and results of athletes. In fact, we spend our life trying to give it an extra meaning to feel over death. The real emotional rooting for the team solves this problem. All that’s left is to make use of understanding it. The more you deify the club’s brand, the more fans will be willing to pay to touch this divinity and become part of it through visiting the stadium and buying merchandise. That is why it is important for the club to develop a personal brand of athletes. The players with strong brands in the team benefit the brand of the club as a whole. Fans need to understand that it’s not just people they can meet on the street who play for their favorite team, but real stars. Remember how thrilled you were over going to the stadium as a child. I’m sure you were very emotional about being so close to your heroes. And now add the division into groups to the terror management theory. It’s a very effective manipulation, which is built on a pretty simple mechanism: we constantly divide people into two groups – us and them. Due to the release of oxytocin, for instance, we treat the “us” group very well and are extremely negative about the “them” group. As you can see, in this case, our brain continues to simplify the surrounding world to save energy. I addressed this topic substantively in a separate article. We are much more susceptible to the influence of various factors than was generally assumed before. And surely, emotions have a sufficient impact on us. Emotions originate in the limbic system of the brain, including amygdala. I detailed the amygdala stuff in my article on the types of manipulation by fans. Emotions are capable of influencing not just our decisions or the way we feel, they can have a serious impact on the existence of our entire body. For example, the holographic theory of life activity formulated by Academician Konstantin Sudakov makes the point that each component of the organism reflects the general properties of the body. But the primary reaction is characteristic for neurons of the limbic system. The more powerful emotions arise, the greater the likelihood is that the body will be willing to solve the set goals. If the result is achieved, the body reinforces them with positive emotions. How can you be popular on social media using emotions? The study by Jacopo Staiano and Marco Guerini, based on the VAD (Valence-Arousal-Dominance) model, has demonstrated that the content that obtains the greatest virality is the one that evokes a feeling of high dominance. Such feelings include inspiration and admiration. These are wonderful emotions that you can link to your brand. The bad news is that the most commented content evokes not the finest emotions – high-arousal emotions (anger) and low-dominance emotions (fear). They are not the emotions to be linked to your brand. The study based on a model similar to VAD and photos of one of the popular Reddit communities showed similar results. The photo of the paramedics who stayed at a woman’s house to cook dinner for her five kids became the most popular, as it evoked high-arousal, high-dominance, and high-pleasure emotions. Simply put, our brain adheres to its evolutionary foundations in this case as well. We like to do good things, it gives us positive feelings. Evolutionary psychology explains it in a very simple way: when you help others, the probability that you will be helped by them in return grows. This increases the chances of survival, and therefore the reproduction (remember that from the perspective of genes, procreation is our main goal). Develop a content that is consistent with such features of our brain and perception. Make the most of the emotions and do not forget about the brand. Some brands are ready to go to great lengths to hook the right audience. But this approach often brings negative results to the brand in the long term.